Starting this thread to talk about issues and updates about the MyMTA app, especially since I'm always having issues with the app on my android phone. Hope this is the appropriate place to add this sub-thread. I like the MyMTA app but I can not seem to bring up the subway and bus maps to see if I can zoom them. The individual subway route line maps are fine with the exception of the subway route bullets being too small for my finger. Actually maybe just a tad larger. Otherwise I think it is a fine app. I am using the MyTransit subway and bus maps on my smartphone. Also using the MTA Subway and Bus Time apps on my smartphone. The app is OK but I hope them could remove that annoying loading animation. I had the same issue with the subway/bus/rail maps.. I couldn't even open up any as they wouldn't come up, I had to email the developer (which is horrible) then I complained to the MTA. How can they have an app focussed on transportation info with no maps working? The developer is so bad, they're using the word "beta" as an excuse to not upkeep the app. I really hope when OMNY launches that they won't use the same developer as MyMTA. The app is so very janky - but whats weird, truly the only reason I'll ever use the thing, it somehow has a more reliable real time data feed than the subwaytime app, or really any 3rd party apps. I modified the topic to include the new MTA site since the new site is essentially the desktop version of the app. Regarding the app, I have always found it to be more cumbersome to get useful information through this app than I would someplace else. For example, trying to get MNRR track info for trains out of Grand Central, it's much easier in my opinion to get that info from TrainTime. For subway arrivals, the MyMTA app suffers the same problem SubwayTime does, in that one has to scroll down the list of stations from endpoint to endpoint in order to get arrival info for their station. While not as clunky as SubwayTime, I still prefer a map-based way to see the train arrivals, which is why I continue to use Underway for this task. Also, MyMTA limits itself in the number of arrivals by only showing the next five trains to arrive in any given direction. That's all fine and dandy if you're at 3 Avenue and the only trains arriving there are trains. Not so much so at express stops or major transfer hubs where one usually benefits from seeing multiple trains' arrivals to better plan their trip. As for the new site itself, I really wish they would pick one. Either move everything over to new.mta.info or stop using that site. 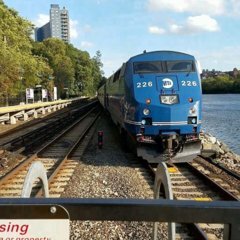 I've noticed that all new train information is posted to the new site, but most of the other information related to long-term service changes, PR notices, etc. are still posted on the old site. It looks really unprofessional to have users circle between two completely different and separate websites to get pertinent information from the same agency. Also, related to this, why am I unable to look at all of the service changes per day like on the old site? It's really cumbersome to have to search service changes route by route, day by day on the new site. I'll say that new.mta.info did have that new feel to it when I first looked at it for 10 seconds. But honestly, it is designed kind of poorly IMO. The look is bland with lots of space (I see some material design mixed with Weebly elements) and colors clash with e/o as well. The font choices are horrific and it's a pain to read large text(s). That makes it harder to locate things on the website overall. The old current design looks like an AOL homepage from 2003 but at least I can get around it a little bit more efficiently. Why waste time and money with this website to begin with? I've also noticed that the real-time subway arrival info is more likely to be accurate in the MyMTA app than the dedicated subwaytime app, which is really concerning. Shouldn't they be getting the exact same data feeds?? It can’t be better for the letter lines I dont think . Subway time is the best cause it Shows you the exact same thing as the clocks in station. They need to upgrade the site as the last refresh was some ten years ago and it shows. Badly. What isn't helping with the new site is the half-assed approach where only some site data from the old site is being transferred over at a glacial pace. The basic design scheme leaves something to be desired, but that's not my main complaint. My main problem is as you said, user-unfriendliness. A lot of the pertinent information is hidden behind several unnecessary clicks. For instance, if you were looking for information regarding this week's Concourse FASTRACK, on the new site, there are a series of additional steps involved in the new site versus the old one. This kind of information should be readily available upon opening the site, not through digging through the webpages. It's the same for their PR notices, which tend to be buried under the "News and Events" header. This setup was somewhat acceptable when the new site initially launched because it was expected that these issues would be resolved at some point. However, as we are almost a year in here, users expect some improvements to the new site where access and readability is on par with the old site, but with a better interface than the previous one. More than the ones touted on the subway posters lately. It works for Railroad but not for the subway. Do you know how many times I have complained to them just about that, and nothing has ever been done to find a solution or at least compromise... They just care about launching the damn app, not fixing it. Its just them playing the game of F*ck All. Oddly enough, they include a minute countdown for the railroads. Why can't they be consistent with this stuff? SubwayTime spits out the information correctly and it looks like straight garbage. Why is the much more polished app worse at providing this information? When subway service is (supposedly) more frequent than rail service, it makes much more sense to display the arrivals as "X minutes away", rather than "will arrive at Y time." Then again, since subway service is so sporadic these days, maybe Transit is conditioning riders to set their schedules to specific arrivals as they would on Metro-North / LIRR. I, too, have an issue with the maps on the app. They will not come up. I am using the MyTransit subway and bus maps. Do you have the app on iPhone or Android? I have a S7 and the maps are now working on my phone. I've used the new app maybe twice. It's too clunky and the splash screen is a waste of time, I want to see updates and countdown times asap. So, I still use Subway Time and Train Time individually. If Subway time could be improved, where if you put in a station with multiple lines it shows you all trunks not just one. (Like Times Square, Herald Square, Fulton St) Sometimes people have a choice and don't want to back out all the way to the list of lines to drill back down to the same station. The New site comes up on the phone automatically when you type in mta.info, so I just use it to check for service disruptions. Its good that they split the lines individually into "good Service" etc. Because on the old site, a slight issue at Parkchester would make the whole look like a disaster. I was never impressed by any of the MTA's site designs.... Fact of the matter is that the heap of information the site offers is just that - disgustingly, almost insultingly laid out (and god help you if you're doing a site search!)....... The thing as a whole is straight up laggy/buggy as hell.... I personally think it's a poor web designing practice anyway to overload/overwhelm visitors with a boatload of info on the front page like that..... If any of you ever had a client (or whoever) had someone try to pitch a product at you in 30 seconds or so, but it feels like they've been there for 30 minutes with the fast talking (a pet peeve of mine) & what not? That's what the MTA's main page is like.... Complete turn off. I don't get this either, apparently the front page of mta.info has a regular translator at the bottom for other languages, nice. Google Translate is also used, however, new.mta.info only has Google Translate, which compared to regular, doesn't translate everything properly and has a bad rap for it's abilities. I use english-spanish usually and it's serviceable surely for some text, but it doesn't always precisely work on all text (especially on articles) and is inconsistent. I can't imagine it being precise for a more difficult language like Mandarin. Bad design that the should address. I forgot to answer this question and I apologise. My cellphone is an Android phone. It has a 5.2 inch screen. One of the few things Jay Walder got right was that he recognized that the MTA would never make a good app on its own, so he just opened up the data feeds for everybody else. I just use the Transit App.